Officer Diego Moreno, 35, died in the line of duty early on July 22. 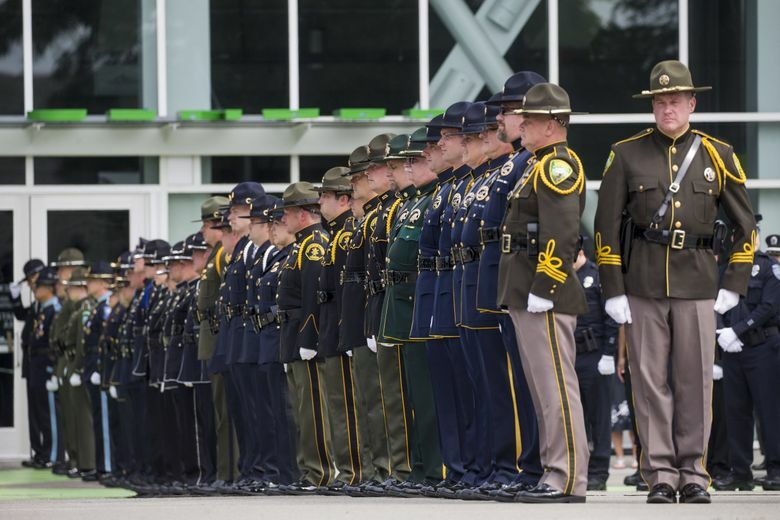 He was remembered Tuesday as an exceptional police officer, a dedicated family man and a loud, fun-loving friend who lived life at 1,000 miles per hour. 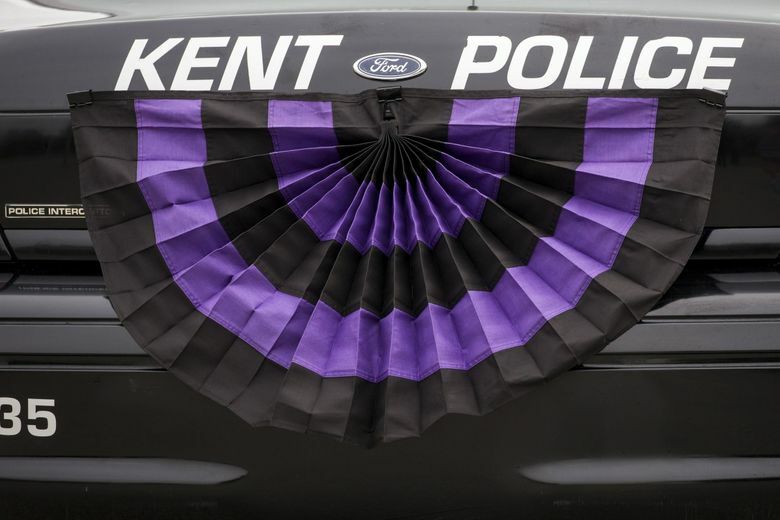 After Kent Police Officer Diego Moreno was killed in the line of duty on July 22, his boots were removed for the last time — to reveal the freshly-painted, bright-blue toenail polish from when he had taken his 6-year-old daughter, Peyton, for a pedicure. About a month ago, he took his son, Adrian, for a haircut and rewarded the 4-year-old’s good behavior with a deluxe Nerf gun that on Tuesday sat among wreaths of flowers, a game-day flag from Washington State University and a wooden box containing Moreno’s ashes on the stage set up at Kent’s ShoWare Center. 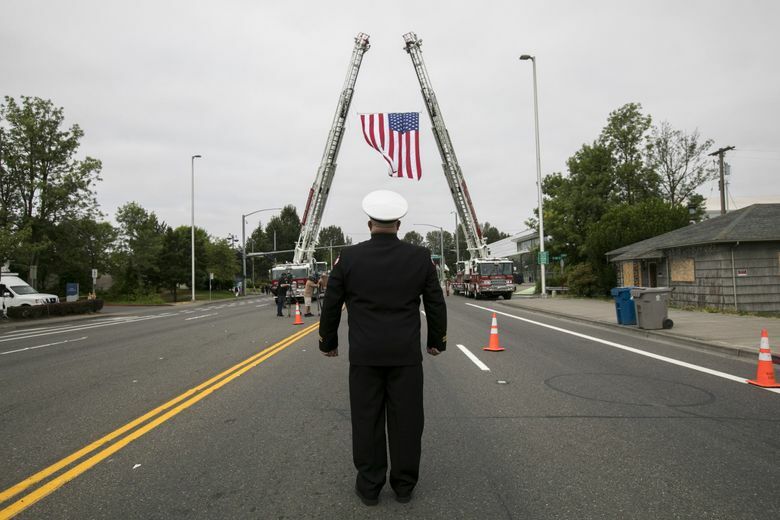 Police officers and firefighters from dozens of agencies across the Northwest paid tribute to Moreno, an eight-year veteran of the Kent Police Department, with a nearly 6-mile long procession of police vehicles and a memorial service solemn with police tradition. 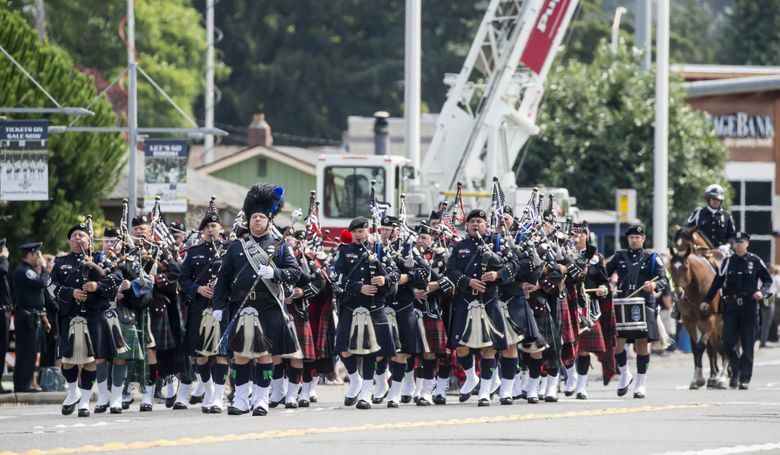 White gloves and dress uniforms, bugles and bagpipes, an American flag suspended between firetrucks and a riderless horse — symbolizing a fallen warrior who never returned home — were all part of the ceremony honoring the life of the 35-year-old. But for his colleagues and loved ones, it was just as important to remember Moreno’s life as a dedicated family man and a loud, fun-loving friend with an infectious smile, a wild mop of hair and a penchant for posing for photographs with his tongue sticking out. He loved food and on a trip to Spain last year, his food bill was almost double the cost of his airfare. 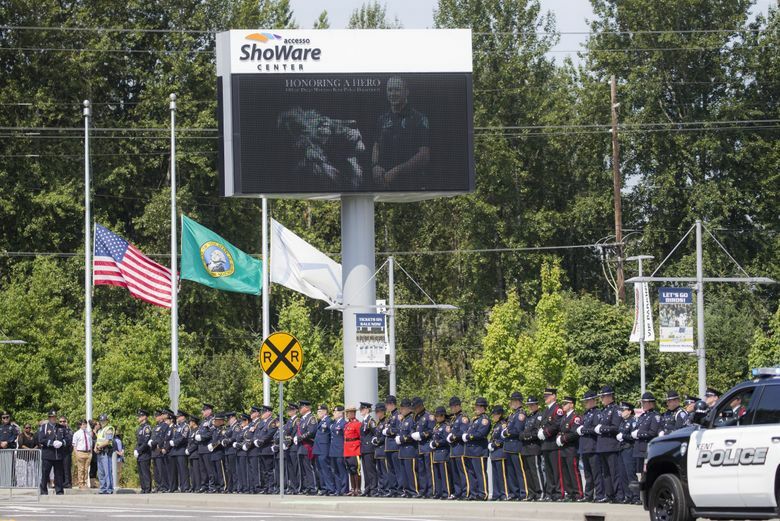 Moreno, one of several officers to respond to a report of gunshots outside a restaurant, had laid out a spike strip on Highway 516 to disable a speeding pickup when he was struck and killed by another Kent patrol officer who was in pursuit. That officer was seriously injured and the driver of the pickup, a 16-year-old Kent boy, has since been charged with second-degree felony murder, accused of instigating the dangerous, high-speed chase that resulted in Moreno’s death. 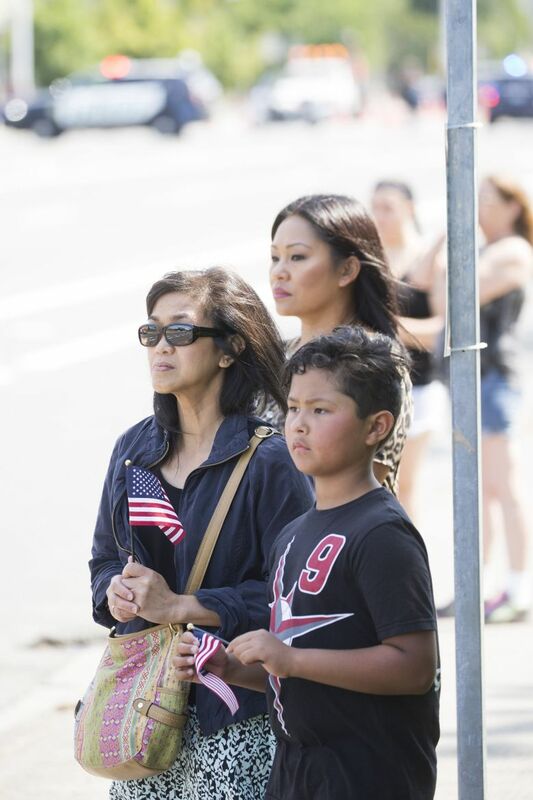 “We’re going to tell a fantastic story about Diego’s life,” Kent Police Chief Rafael Padilla said Tuesday. While Moreno was a skilled crime fighter and could have had his choice of assignments, he purposefully put himself in positions where he could connect with people, Padilla said. 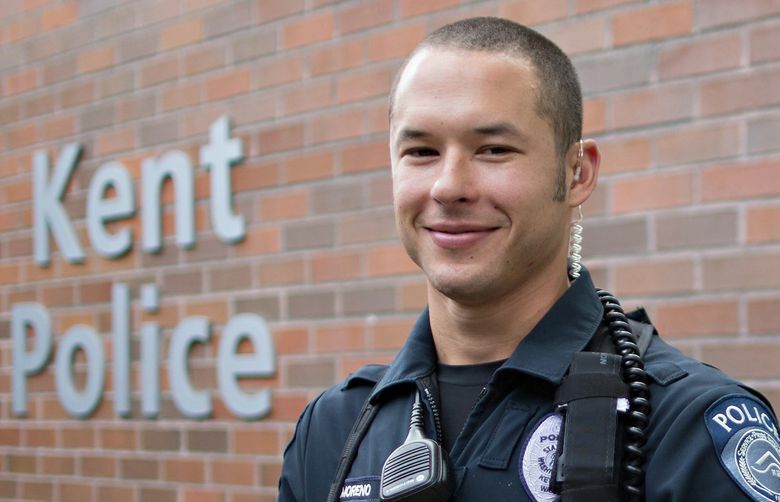 Working primarily in the department’s patrol division, Moreno served as a hostage negotiator, a field-training officer and the department’s recruiting officer. “He was chosen because he was the best of us. 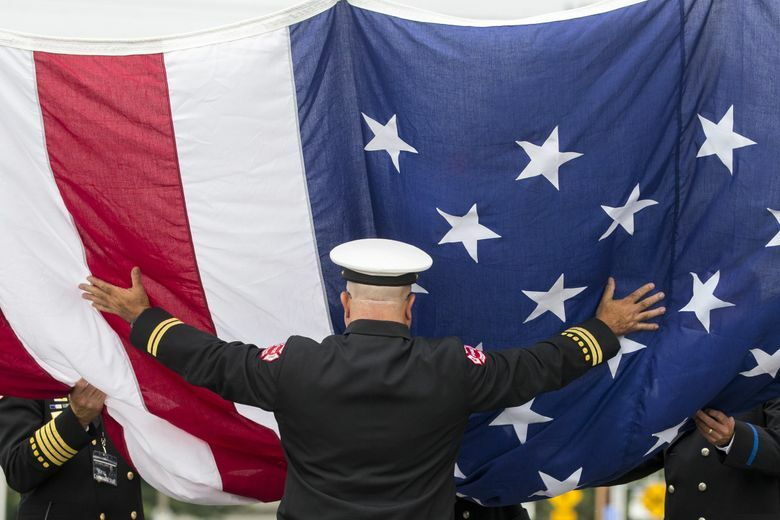 He did more in eight years than most of us do in 20,” the chief said. After saving a drowning boy in 2011 and rescuing an elderly woman from a burning building in 2016, Moreno was posthumously awarded his third Life Saving Award for saving the life of a 2-year-old girl who wasn’t breathing when she was pulled from a pond at an apartment complex in April, said Kent Mayor Dana Ralph. On the afternoon before he died, Moreno; his wife, Shelly; and their two kids attended an officer-appreciation barbecue held in Ralph’s backyard. 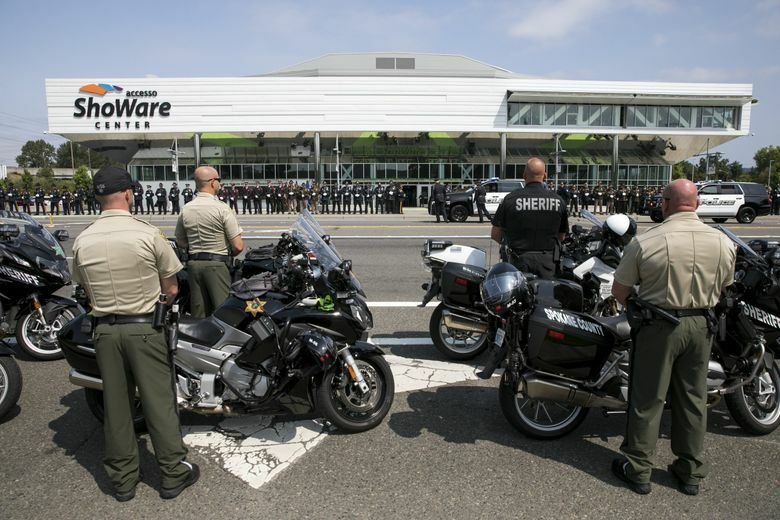 Twelve hours before he died, Moreno left the gathering to start his shift. “The last time Diego kissed Shelly was in my yard … I will hold that memory forever,” Ralph said. His mother, Lizzie Moreno, spoke of her son’s love for his native Venezuela and how on a trip to Washington, D.C., he was only interested in visiting the memorial to the country’s fallen police officers. Now, her son’s name — chosen “out of the blue” by his father — will be carved into that monument. “Today, July 31, is a day Diego has commemorated since preschool,” she said, explaining Moreno’s patron saint is Saint Ignatius of Loyola, whose teachings were all about love and service to others. Saint Ignatius was her son’s “spiritual guide whose teachings he followed till his last breath,” Lizzie Moreno said. Shelly Moreno said her husband was like a big kid and his ability to play was unmatched. “It’s easy for you to see Diego loved police work. One thing he loved more was being a daddy,” she said. He worked the late swing shift “so he could have daily daddy duty” before going to work. 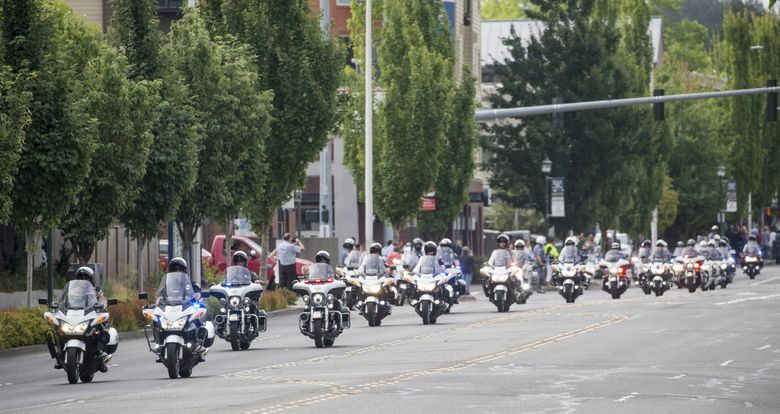 Officer Matt Mullennix, who was hired by the Kent Police Department shortly before Moreno, said his friend and longtime partner had spoken about the possibility of dying in the line of duty and would have wanted his memorial to be a celebration. “He would want me to be hilarious and inappropriate and crass. If I offend anybody, I’m sorry — but I’m not sorry,” Mullennix said. He recalled how Moreno blew out his knee during his academy training but instead of getting surgery right away, Moreno “just slapped on a brace” so he could finish on time; how Moreno could inhale breakfast burritos and how his fuse would grow short and he’d scold people he contacted to stop acting like children. “He lived his life at 1,000 miles per hour. He lived with such intensity,” Mullennix said. Turning serious, Mullennix addressed Moreno directly: “You always had our backs, buddy, whether we knew it or not.